Rega Elicit-R review | What Hi-Fi? The longer we've known the Rega Elicit-R, the more we've fallen in love with it. When we first heard it in 2014, it won an easy five stars, but didn't win its Group Test at that price, being just pipped by the Roksan Caspian M2. It's now 2016, and due to some price changes of rival products, it now stands out as one of the best amps you can get for the money. So much so it has a 2015 and 2016 What Hi-Fi? Award to its name. What immediately captures your attention is its surefooted sense of timing: the agility and control it has over its rhythms is hugely impressive. Play Kate Bush’s Watching You Without Me, and indivudual instruments have impeccable precision, keeping the complicated arrangement cohesive and interesting. It’s particularly talented with vocals: Kate Bush’s voice sounds ethereal and delicate. The Rega Elicit-R digs up incredible detail, too. Drums hit with realistic impact and tautness, while Clint Mansell’s complex ambient Moon soundtrack sounds impressively solid and composed. While the older Rega Elicit showed dynamic restraint, the Elicit-R is much more forthcoming. The amp’s composure lets the loud parts sing out gloriously, while quieter moments of a song still exhibit plenty of detail. Some might find the Elicit-R has a slight leanness and a hint of brightness, particularly if you compare it with the full-bodied Roksan K3. However, the Rega makes no attempt to smooth things over. It trades that warmth and smoothness for transparency. And it thinks nothing of conveying all the flaws in a recording – so it won’t be forgiving with poorly produced or low-resolution material. The same characteristic runs through the built-in moving-magnet phono stage. We fired up our Rega RP6/Exact turntable (£1000) with a copy of David Bowie’s The Rise and Fall of Ziggy Stardust and the Spiders from Mars. If you love hearing the tactile fluidity of vinyl records, this Rega amp is worth a listen. Sweeter sounding amplifiers might be a more relaxed listen, but the Elicit-R does a great job of revealing a song’s intricacies. You can see the Rega Brio-R’s influence in the Elicit-R’s design as well as its sound. The Brio-R’s square metal buttons and red LED indicators feature in the new front panel, giving it a more modern look. And gone is the swooped-in effect on the former Elicit’s top panel; it’s much neater now. The custom metal case still has a black satin finish, and is as solid as ever. At 13kg it’s rather heavy too – which helps the premium feel. A single rotary dial serves as both the volume control and the input selector (press the mode button to switch between the two). There are satisfyingly audible clicks when pressing the buttons and turning the dial to select one of five inputs. The volume dial is surrounded by 20 LEDs that light up as you turn clockwise, although we wish the stepped attenuator control had a touch more resistance when clicking through the volume levels. You also have the option to dim the LEDs on the front panel – press the mute button in ‘Input’ mode to choose from three brightness levels. The Elicit-R outputs 105W per channel into 8 ohms (which, honestly, is plenty for most situations), it isn't the most powerful amp we've tested recently and it offers a more compact soundstage than, say, the Roksan K3. It's still far from small though, and filled our test room convincingly. The back panel is good and simple, with just a single set of speaker terminals – but there are plenty of analogue connections. There are five line-level inputs, one of which is a moving-magnet (MM) phono stage. Inputs two to five can be used to hook up CD players, DACs, tuners, streamers and Blu-ray/DVD players. The MM phono input can be turned into a normal line level input at the flick of a switch. Rega argues that it benefits from extra noise isolation compared with the standard line inputs. As before, there are no tone controls or headphone sockets to be seen on the Elicit-R. Rega considers these ‘superfluous gadgets’ that compromise the overall sound quality. There are, however, a tape loop, preamp output and, unusually, a direct input into the power amp section. What's more, there's two record outputs: one for recording, and another (Record Output Link) for feeding a line-level output to, say, a headphone amp. The Elicit-R does come with a remote control (hence the ‘R’ in its name). 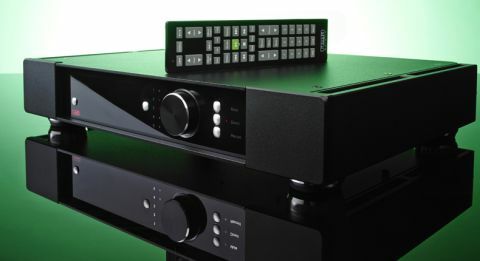 The included Solaris system remote can control all other Rega R-series products too. If you only have an Elicit-R, the volume buttons will get the most use. They’re nicely responsive, but it’s easy to confuse them with the similar-looking input buttons. Circumstance may have helped this amp become our favourite at this price, but its constant ability to impress with its fine detail retrieval and superb timing is the reason it's been able to hold on to our affections against good competition. It might be one of the more priciest amps, but one listen to it will show you why.